When it comes time to give your kitchen a makeover, deciding on which cabinets to choose is easily one of the toughest decisions you will have to make. There are many factors that should be taken into consideration before making a decision and doing a bit of research will help to figure out the best materials to suit the project. Thinking about the overall theme of your house and the space you have to work with will help narrow down the choices. Different materials offer different qualities, so figuring out the ‘feeling’ you are looking to achieve in the space is important. 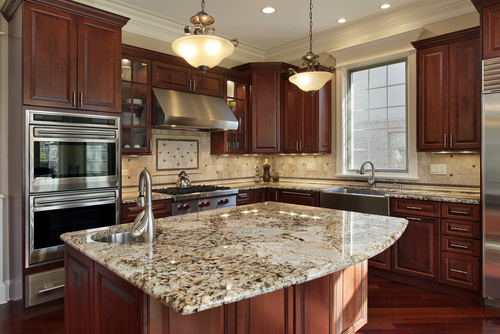 There are various types of materials commonly used for building kitchen cabinets. It is undeniable that for real quality kitchen cabinets there is nothing better than natural wood. Solid natural woods produce a feeling that composite and synthetic materials simply cannot reproduce. Even more, they do not deteriorate over time the same way since wood cabinets can last up to 50 years. Make the countertops wood, and have a kitchen that will last 150 years! The following types of tree woods are the five most commonly used woods seen in cabinetry, that make quality kitchen cabinets. Oak trees are found all over the world and are therefore the most commonly used of the natural woods. They are easy to find, stain and finish in addition to being highly durable. These qualities are what make oak a great choice in any setting. Oak’s graining is strong enough that it shows through any color stain you apply to it. Colors for oak woods vary from a dark brown to light tan and because it takes so extremely well to any color stain, you can achieve just about any hue you want. Unlike oaks, cherry woods are softer and more versatile, making them easy to work with. They are unique because over time, and with direct sunlight, they turn from a lighter color to a deep red allowing their natural hues to appear. Cherry wood has a striking look, radiating its natural red hues. It is a hard and durable wood, yet easy to work with. The high quality kitchen cabinets that this wood produces are the reason homeowners are willing to pay more for it, making cherry the most expensive of the five most common woods used in cabinetry. Hickory is a durable, mid-ranged priced wood that is extremely popular in cabinetry. Offering a variety of different species, they are found in abundance, making them very easy to locate. Not only are they easy to find, but also they are a very sturdy wood, the sturdiest of woods in fact! The colors of hickory woods range from shades of dark brown to shades of white. The wood boasts its natural streaks in a random fashion, promoting its beauty and accents. Much like oak, hickory takes very well to light or natural stain. Pine is another popular wood choice by homeowners who are designing their kitchen cabinets. This wood is very cost effective and is generally the least expensive of the five most commonly used woods. It is often used for French, American, or English country settings, largely because it antiques and distresses beautifully. Pine provides a yellowish cast, making it a prime choice if you are looking to achieve a rustic feel in your kitchen. Over all, pinewood tends to be lighter in color, but it takes nicely to staining, allowing a variety of looks to be achieved. The only major drawback for using pinewood for your kitchen cabinets is that the wood can be easily prone to being nicked. Maple is another wood that produces great quality kitchen cabinets and that carpenters adore using, based solely on its adaptability. It can be stained any color or shade yet will always maintain its beautiful natural wood grain look. Although pinewood is generally known as the most cost effective choice for a natural wood, most of the maple wood cabinets are manufactured in Asia since this is the area of the world where most maple trees are found. Because they are manufactured close to the source, costs can be cut dramatically and may end up being a better fit for your budget. Are Natural Woods The Way? Natural wood cabinets may be the most durable and versatile options when shopping for cabinets, but they may not always be the best choice for you. Woods can sometimes have a negative reaction to the surrounding area. For example, if you live in a place that has high humidity, over time the cabinets may experience a bit of warping. It is also important to keep in mind that while shopping for natural wood cabinets, retailers promote kitchen cabinets as “wood” but in reality they are made using a variety of other products.